OXO2 is a chic, contemporary space offering spectacular panoramic views across the River Thames. An iconic location, bright spaces and stunning views combine at this prestigious London event space, creating an inspirational setting for Christmas events. POP! 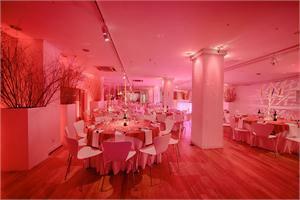 is this year's theme, creating a fun and funky space for winter events at OXO2. The design has been inspired by the colour and vibrancy of the 1960s, with themed objects reminiscent of the lighthearted atmosphere of the era's popular music. Iconic pieces include retro arm chairs, bright sixties imagery, television sets and a host of sixties memorabilia. An extraordinary monochrome dance floor has been designed in keeping with the theme, for exceptional POP! parties this winter. Guests will be astounded by the subtle sophistication of this clean, contemporary space. A chic, understated design allows panoramic views of the capital to take centre stage, for the ultimate London backdrop to your event. Subject to number of guests and date booked. All prices are subject to VAT.